Labour, led by Jeremy Corbyn, has thrown itself full scale into the struggle to block a No Deal Brexit. The latest step in this was the correct decision not only to put forward Labour’s own proposals but to whip Labour MPs in favour of Yvette Cooper’s Parliamentary amendment - which would have lifted the 29 March deadline to give a period of time for Parliament to change the law to block a No Deal Brexit. Even although this was defeated, because a small number of Labour MPs opposed Corbyn and instead supported the government, it was entirely correct for Jeremy Corbyn and Labour to have continued the fight against No Deal - and this will have been overwhelmingly supported by Labour voters, Labour members, and supporters of Jeremy Corbyn. For reasons analysed in this article the willingness of the Tories to consider a No Deal Brexit is an attempt to carry out a policy which will constitute an extremely severe attack on the working class and ordinary population. This fight against a No Deal Brexit is a key part of the current struggle to prevent a severe and enduring attack on living standards. It involves much more serious and damaging issues than short term disruption from No Deal. To understand a No Deal outcome would clearly be a terrible option, involving major loss of jobs and attacks on living standards, it is worth examining it in detail and from a fundamental aspect. This shows why the struggle to block a No Deal Brexit is not merely tactically correct but flows from fundamental features of Marxism. The small minority of economists who advocate a Hard Brexit or No Deal have recently begun to address the question from a fundamental viewpoint. This is largely in response to the risks that some major international manufacturers may be forced to leave Britain if No Deal is enacted. Other companies have already begun to halt, close, or relocate operations. These include among others, Jaguar Land Rover, Honda, AirBus and of course Dyson, despite its founder being a prominent supporter of Brexit. But this model exists independently of Brexit and even of this country. Neither is it a ‘capitalist plot’ – in the sense of an arbitrary subjective decision by capitalists. It simply reflects the current development of modern complex production along lines analysed and foreseen by Marx long ago – the increasing division/socialisation of labour which has necessarily now assumed a globalised form. The Brexiteers cannot abolish the model, any more than the law of gravity can be repealed, their plans can only achieve Britain’s removal from it – with serious damage to production and therefore jobs and living standards. This model, of highly complex, integrated supply chains where components arrive just-in-time and where value is added at a series of specialist locations, is simply the modern expression of the most fundamental economic forces analysed in ideas which were first set out with the founding of economics as a science and which were further and most fundamentally developed by Marx. The division of labour encapsulates the process by which an entire complex chain of goods is created through a series of tasks performed separately and distinctly before they become the final finished product. The material expression of those tasks are the inputs of intermediate goods - Honda’s two million parts a day and the supply chains that so antagonise the Brexit-supporting economists. In Adam Smith’s famous example, no single individual could or can possibly produce even the simplest product of his day, a pin, without the inputs of a huge number of other industries. The production process, from raw materials, to intermediate goods is just too complex. Furthermore, this division of labour long ago passed over national boundaries. Smith himself pointed out that it was as easy then to transport coal from Newcastle to Amsterdam as it was to London (both were done by sea, which was then a far more efficient mode of transport than road). In the course of economic development, which has of course been overwhelmingly capitalist development, the division of labour, or what Marx calls more scientifically the ‘socialisation of production’, becomes ever more international, rendering purely national large scale production increasingly obsolete and impractical. The prime example used by Marx and Engels of this development at the time when the Communist Manifesto was written was England. Part of the genius of Marx and Engels was to foresee trends almost uniquely apparent in England at that time, and understand how they expressed the development of the world economy. This was at a time when England’s openness to trade was equivalent to just 13% to 15% of GDP, when currently the most advanced economies have an openness to trade far in excess of that. According to the World Bank world trade as a proportion of world GDP was 56.2% in 2016. The world economy is gripped by the ‘cosmopolitan character to production and consumption in every country’ foreseen by Marx and Engels 170 years ago. The idea that a socialist economy would not aim to make the maximum possible use of the international division/socialisation of Labour therefore has nothing to do with Marx’s analysis but was introduced from Stalin onwards in the USSR. The consequent cutting off of the USSR from participation in the international division of labour was one of the primary reasons for the problems of the Soviet Union’s economy and the final collapse of the USSR. In contrast China’s ‘reform and opening up’ policies, which oriented China to attempt to use to the maximum participation in the international division of labour, were a return to Marx’s analysis, and produced the most rapid growth of a major economy in human history. It is crucial for defence of working-class living standards that the left follows the analysis of Marx and not that of the former USSR. This cosmopolitanism in production and consumption, which today is sometimes called globalisation, takes different precise forms in each country. As much as it irritates Brexiteers, the truth is approximately half of all trade in goods to and from Britain is with the EU. The international division of labour that Britain’s economy participates in is primarily with the EU. The US is only a distant second, approximately one-sixth the size in relative importance in trade in goods to the EU. With a No Deal Brexit there would be two hammer blows that would severely damage that participation, which is expressed as ‘supply chains’, which are another name for the complex process of creating inputs. The first is the imposition of tariff barriers, which would necessarily occur to any production outside the EU’s customs union. The second are non-tariff barriers, which are largely a function of being outside the Single Market, which has a single, unified regulatory regime including for input goods. It is conceivable the effect of increased costs from tariffs could be off-set by lowering costs elsewhere. Some might argue that subsidies to industry in the form of state aid might be worthwhile, even though the World Trade Organisation also has prohibitions on certain types of state aid, as the EU does. If state subsidies of 10% per cent were required to off-set EU tariffs, the resulting cost of £27.5 billion would be in excess of the planned budget for increased public investment for an incoming Labour government. Otherwise, the more likely off-setting factor for new tariffs would be a sharp attack on wages. In short state subsidies to offset a no deal Brexit would cost the entire amount by which Labour intends to increase public investment. But it is the non-tariff barriers which could prove even more damaging. Here the practical example of a country at a less developed stage of economic development, and therefore less integrated into modern division of labour, is useful in illustrating the fundamental issues involved - Turkey. Turkey is in a customs union with the EU since the beginning of 1996. The Turkish economy has developed strongly since that time. The effect of Customs Union membership has been to give greater access of Turkish goods to the EU Single Market (except agricultural goods), and vice versa because tariff barriers are removed. Over time, it has helped to develop the growth of an important car production sector, including for export to the EU. This is the by-product of the Customs Union. But it is not a member of the Single Market. So, non-tariff barriers remain. It is therefore extremely difficult for Turkish car production to become properly integrated into the continent-wide car production of the EU. Instead, production is mostly focused on stand-alone models, niche production or ultra-cheap models. Under a No Deal settlement the entire car industry in Britain would be outside both the Single Market and the Customs Union. Under WTO rules, which would apply in case of a No Deal Brexit, a 10% tariff on car exports would apply – making production in Britain uncompetitive in the EU market. A similar process would apply to all production which is highly integrated with European output. It is no accident that that it is AirBus, car makers, advanced manufacturers and pharmaceuticals companies who are most vocal in their opposition to a No Deal outcome. It is sometimes argued that the EU would block a fully socialist economic policy. This is true. Britain would be forced out of the EU if it attempted to replace capitalism with socialism. The gains from the introduction of socialism in Britain would be so great that they would more than offset the disadvantages of being forced out of the customs/single market of the EU. But while Jeremy Corbyn’s policies are highly progressive, and would significantly take working people and the mass of the population forward, they do not propose to replace capitalism with socialism. Nor should they – neither the objective nor the subjective conditions to bring capitalism to an end and introduce socialism in Britain exist. What Jeremy Corbyn proposes are a series of highly progressive reforms which are in the interests of the population both in Britain and internationally – and that is exactly what should be proposed at present. Attempting to implement such progressive changes by a Jeremy Corbyn led government might be blocked by the EU – but this is not at all certain and will be determined by the relation of forces at the time. But if implementing such progressive changes is blocked by the EU then the population will understand why Britain may be forced out of the EU. The same would apply to any country or countries who moved ahead of this country and were themselves replacing capitalism with socialism. But what is wrong, is against the interests of the working class, and therefore will not be supported by the population, is voluntarily to give up the advantages that flow from participation in the EU’s division of labour – therefore cutting off Britain from the most advantageous participation in EU markets and supply chains. The Brexiteers, including the pro-Brexit economists, provide no concrete analysis that can withstand any scrutiny. Instead, they fall back on general expressions of optimism, or complete red herrings. Crucially, there is the assertion that No Deal or something close to it ‘will allow us to trade with the rest of the world’. On the contrary, this economy already trades with the rest of the world. No Deal will put major barriers in the way of the current trade with the EU, with nothing realistic that could compensate for that – other countries are naturally much more interested in trade with the far larger economy of the EU than with the comparatively small economy of Britain. The weight of each of these can be illustrated with reference to one of the most integrated industrial sectors, Britain’s participation in Airbus. Other advanced sectors of production show the same characteristics. Some months ago, when Airbus executives previously highlighted the risks to their business from No Deal, one Tory MEP raged that, “we can build our own Airbus”. This foolish bluster highlights the level of ignorance about the economy fostered by the Tories. Whether the ignorance is wilful is difficult to say. For this country to create ‘its own Airbus’, would be an enormous, potentially crippling, and in reality a totally unrealistic undertaking. The market capitalisation of Airbus has fluctuated between €75 billion and €100 billion in recent months. Its great rival, Boeing is currently valued at over $200 billion, having recently been as high as $360 billion. But this is only an indicator of the type of initial outlays required to create a new Airbus-type company in this country. As shown above, an industrial giant like Airbus requires an enormously complex supply chain. 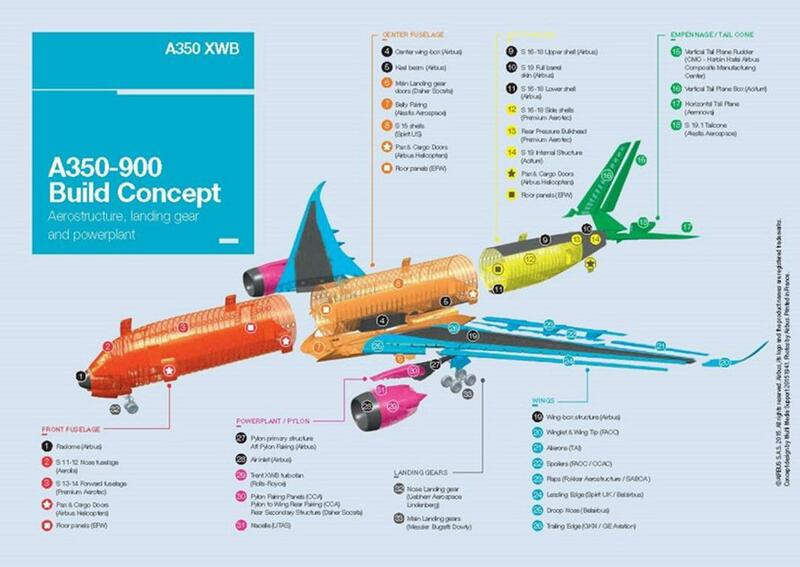 The chart below is from Airbus and highlights this point in relation to just one of its models, the A350. According to the company, the components made in various countries themselves rely on a supply chain which includes operations all across Europe and beyond, with 4,000 companies and over 100,000 jobs in this country. To overcome the imposition of both tariff and non-tariff barriers arising from No Deal, an entire supply chain would need to be replicated in this country. This position is not at all unique to Airbus. In the course of the public debates about the effects of No Deal it was revealed that Jaguar Land Rover uses 25 million components a day in producing 3,000 cars, and that 40% per cent of these come from the EU. Investment in the motor industry already feel by 50% last year, due to the situation created by the threat of Brexit, which will translate into thousands of lost jobs over the medium/long term. The illusion of the Tory MEP is that all of this would be a massive boost to manufacturing jobs in this country and the wider economy. The fantasy is that Britain, maybe with even bigger cuts to wages and much reduced protections for workers, could compete by replicating these enormous industries on a national scale. Unfortunately, he is not alone in this illusion. Production is the first factor. But this is integrated, complex production, not just the finished goods but also all the inputs required for those finished products. There is the cost of establishing an AirBus-type company based in this country, say the equivalent of €100 billion. There would also need to be the creation of a supply in support of that. As Airbus estimates the workforce in the current supply chain for AirBus components in this country is about 7 times greater than the direct workforce employed here, that may indicate the scope of the additional investment needed. And all of these would need a workforce trained in highly specialist manufacturing skills, and an infrastructure, of roads, rail, energy and water services to supply them. But production is not the only factor. As Marx and Engels wrote, the development of international production was accompanied by the growth of, “….industries whose products are consumed, not only at home, but in every quarter of the globe”. A ‘British Airbus’ would require a market. As the production from all investment is limited by the scope of the market, and the demand for aircraft is a global market, no country of Britain’s size could hope to establish a new large-scale aircraft sector solely or even primarily on a national terrain. British Airbus would therefore have to compete directly with the two dominant global producers, Boeing and Airbus. British Airbus would in effect need to make huge investments simply to establish itself as a third competitor to two global rivals who are already engaged in an existential struggle with each other. It would need to be more competitive and efficient than either of these two to win customers, requiring much higher rates of investment. And it would have to attempt prise open new markets in the face of fierce resistance from the US and EU authorities, who already have one of the most bitter and long-running disputes lodged at the World Trade Organisation. The whole project would be a fool’s errand. The reality is that the advanced manufacturing that does take place in this country is integrated with the world economy, and primarily the EU economy. What is actually required is for large-scale investment to fortify and develop those sectors, one part of which is their deepening integration into the world economy, primarily the EU economy. This is a policy that Labour’s economic policy encourages, and which the Tories resolutely oppose. By blocking effective participation in the most advanced sectors of production thousands and thousands of jobs would be lost directly, the entire economy would be held back and therefore living standards would rise more slowly than possible – at best. Due to this economic setback the pound would almost certainly devalue significantly, creating inflation and a reduction in living standards. In order to attempt to make British capitalism competitive in the new unfavourable circumstances employers would launch an all out attack on workers living standards and rights – the ‘hard Brexiters’ have already made clear their ideal is a low social protection economy of the US type. It is important to note that there is a set of circumstances under which the above economic factors take second place. If an incoming radical or socialist government were taking measures that were so contrary to the other European governments, they might well take steps to cut off that government from both EU institutions and the European market. But that is the traditional punishment that anti-socialist governments and institutions mete out, the US increasingly so. But it is a punishment. It should not be a policy aim. Under those circumstances, the long-term political, social and economic benefits that a socialist government could deliver would far outweigh these serious economic difficulties. But that is not the situation currently, and is not likely to be in the foreseeable future. Crashing out with No Deal in this period in reality means the only viable alternative is a trade agreement with Trump and his successors. No-one who thinks about it seriously can actually believe that that outcome would be more favourable to the socialist project. Whether for the reason of defence of the immediate living standards of the population and working class, or for reasons of fundamental Marxist theory, or both, there should be 100% opposition to a No Deal Brexit – and Jeremy Corbyn correctly led total opposition to it. Finally, if a No Deal Brexit is totally against the interests of the working class, for the reasons outlined by Marxism, what positions are in line with those interests? These have nothing whatever to do with nonsense claims by people from the Labour right, such as Will Hutton. that the EU is progressive representing ‘Enlightenment values’. In fact the ‘Enlightenment values’ were accompanied by the creation of the greatest colonial empires the world has ever seen, oppressing the majority of humanity, dividing the world between them, and culminating in the historic catastrophe of World War I. The EU is a cabal of European imperialists who, compelled to construct a unified European economic structure because modern production has outgrown the European state, set out about creating it in the most undemocratic form possible – with as little power as possible to the European parliament and transnational power concentrated in the non-elected European Commission. The best historical analogy is Bismarck’s Germany – the Germany capitalists, forced economically to create a unified German state, deliberately also created it in the most undemocratic form possible. · Labour’s goal in its ‘six tests on Brexit of securing: ‘the “exact same benefits” as we currently have as members of the Single Market and Customs Union’. · Membership of the EU. Therefore, the bloc of Remainers and supporters of a ‘soft Brexit’, which is the position of the huge majority of Labour voters, Labour Party members, and Jeremy Corbyn’s supporters, have a position which fully corresponds to the interests of the working class and the population – which is exactly why it is the majority position among them. It is also a position precisely in line with Marxism.